Golden Grimoire is a latest 5 reel video slot, with 40 paylines powered by Net Entertainment software provider. Video slot takes it place in the world powered by Wizards. Action takes place in the library of old tower. Graphic are high quality, which is usual in all NetEnt slots. Low value symbols are appropriately themed 4 playing cards suits (Hearts, Clubs, Spades and Diamonds), whereas high value symbols are various insects and gemstones. In addition, Scatter and Wild symbols are available as well. 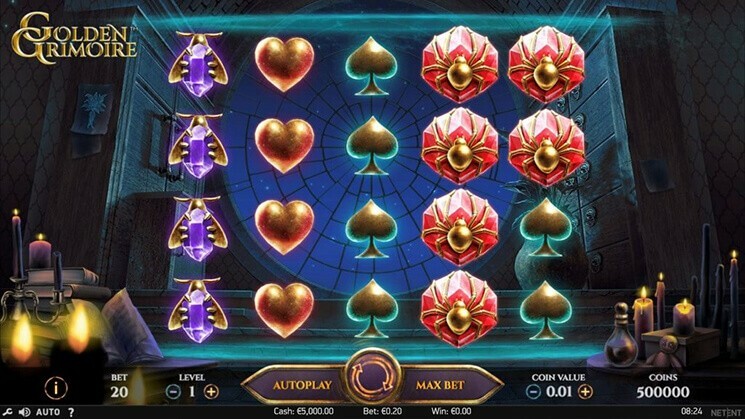 Before investing real money players can try Golden Grimoire Slot for free, or visit any NetEnt Casino such as: Big City Slots, RedStar Casino, Vulkan Vegas Casino and others to play with real money and win. Game release date is currently 21st February. RTP – 96.44%. Before you visit world filled with magic and wonder, your bets need to be placed. Coin denominations can be adjusted using “Coin Value” button. Number of coins per line can be set by “Level +/-“. Highest bet value can be placed by “Max Bet”. “Autoplay” button is for setting up number of times the reels will turn automatically and “Spin” button is represented as two arrows. Mystery Symbol feature activates when 1 or more Spellbook symbols land on the reels. Spellbook symbol will transform in any random different selected symbol even Wild symbol. If Mystery symbol (spellbook) matches leftmost symbol on the same row, all the symbols between them will also transform in to that symbol. Free Spins feature activates when Mystery symbol hits anywhere on 1st, 3rd and 5th reels. When players trigger this feature you will be awarded with 8 free spins. During Free Spins players can also trigger Sticky Mystery Symbol feature, which is mix between Free Spins and Mystery Symbol feature. Sticky Mystery symbol can land anywhere on the reels, except for the 1st reel. Sticky symbol will transform in to a other random symbol and it will stay in the same place during whole duration of the feature.